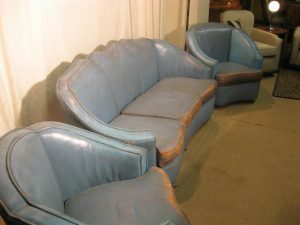 An original Art Deco Angular three piece suite with sofa and two chairs.This suite will look stunning once upholstered. 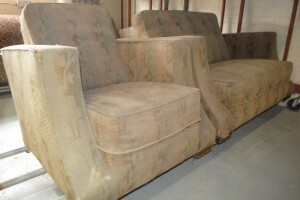 We can sell it in its present condition or upholstered. 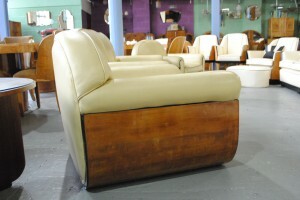 An original art deco 3 piece suite, a fantastic shape and very comfortable. This suite is great quality, very heavy and very well made, all the basics are there for a exceptional finished piece.Just needs a little of your imagination to choose the colour. Amazing! For more details please call 01257 473688. Why not visit our showroom to see examples of our high quality finish when our suites are re upholstered. This is superb. A wonderful shaped Three peice suite. Will be totally unique when we have worked our magic.Please clcik on details to see more photos.You can call us on 01257473688 at any time or why not visit our showroom to see examples of our high quality finish when our suites are re upholstered. We have a wonderful display and selection of original Epstien cloudback suites. 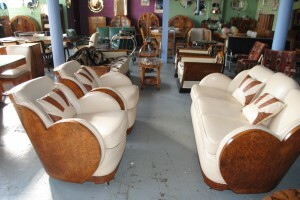 You wont find a selection like this anywhere else in the world other than at cloud 9 art deco. This Iconic Art Deco original suite is in great condition and ready for delivery. Burr walnut veneers and cream leather with matching sunburst cushions.